Rockwood Electric Utility has adopted the following rules, regulations, and rate schedules which are consistent with its contract with TVA for the resale of electric power to its consumers. These will apply to all class types of service requested whether by contract or other agreements. Acceptance of service from the Utility constitutes approval by the customer of these rules and regulations but in no case shall they relieve any other existing or prior obligations to the Utility. All rules and regulations for the health and safety of its consumers as well as electrical inspections are given for guidance and REU will not be expected to enforce or be responsible for their application or use. All electrical wiring by the customer or its contractor should be installed by the standards of the National Electrical Code and the State of Tennessee – Department of Commerce and Insurance. It is the responsibility of the State Inspector to inspect customer wiring to determine if it is installed according to standards and if it is safe to be connected to the Utility electrical power source. 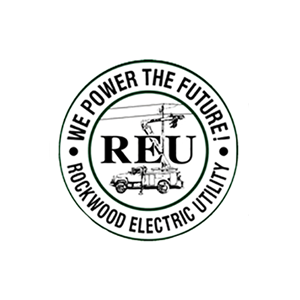 REU reserves the right to refuse service if not approved by the State or if the installation for hook-up is not installed in the proper location and by the standards established by the Utility. The Utility accepts no responsibility for damages to property or bodily injury where violations occur. These rules and regulations are subject to change or revision without notice and when approved by the Board are to take effect immediately. Payment information will be kept confidential and will not be used for any purpose other than transactions. We generally do not issue refunds for payments. However, if you have a question about your payment, experience any problem and/or you wish to inquire about a potential refund, please call our office at 865-354-0514. REU now offers our customers the convenience of paying their bill via the Internet, our payment kiosk, available 24/7 and located at the main office drive-through, by telephone interactive voice response, or toll-free by calling 866-276-2491. Information to customers about rates and service policies are available upon application for service and upon request. Requests for information may be made in person at the Rockwood or Kingston Office or by phone or mail. 1. Apply in person at the Rockwood or Kingston Office. 2. Have a current rent receipt or lease agreement if you are renting; if buying, we must see proof of purchase. 3. A valid ID is required. 4. All fees must be paid at the time an application is made for service. For new construction please refer to the Customer Policy at the bottom of this page. All information should be listed there, for questions call our office at 865-354-0514. 1. Call REU or come by our office. 3. Some personal information may be asked for verification purposes. Or an excellent Letter of Credit of current 12 month history from current utility. Internet Payments are now available. Click here to pay your bill online using your utility account number and zip code. A confirmation number will appear on your screen once the payment has been processed. Please keep a record of your Confirmation Number, or print the page for your records. If you do not receive a confirmation number please contact our office at 865-354-0514 prior to attempting to make another payment. With “Budget Billing Plan” customers can pay the same amount for 11 months. In the 12th month, the budget billing settles up. If the customer has a credit it is applied to the account. If the customer has a debit it is paid in full on the bill. Differences are shown every month on the statement. If you are interested call the office at 865-354-0514 or complete the online application (Budget Billing Plan). Anyone who is already on budget billing will stay on it until they request to be removed from it. Payment information will be kept confidential and will not be used for any purpose other than transactions. We generally do not issue refunds for payments. However, if you have a question about your payment, and/or you wish to inquire about a potential refund, please call our office at 865-354-0514. Customers shall be notified of the availability of service policies, rate information and energy use by public displays, radio, newspaper or mail.